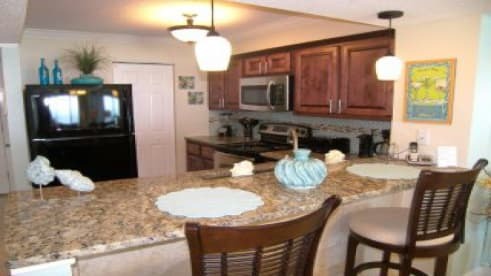 Every rental is beachfront and there is plenty of space for everyone! Our 1500 feet of private beach front is what separates us from the rest. We have a room that’s right for you and our staff is on-site to make sure your vacation is fun and relaxing. With years of experience, we’re dedicated to making your Panama City Beach experience the best. We don’t want you to miss having a wonderful vacation here at the Dunes of Panama. Our condos consist of 2 bedroom units that can accommodate from 6 to 8 people with square footage of approx 1150 sq. 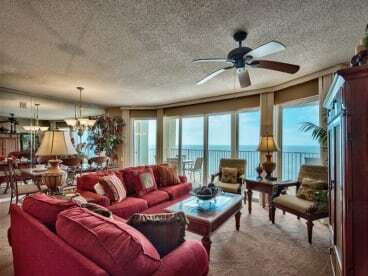 ft. Each unit has its own private balcony for you to enjoy your mesmerizing view of the Gulf of Mexico. The amenities don’t stop there! We have 3 large, gulf-front pools, one heated pool December 1st through May 1st, 2 fire pits, a fitness room, and several activities including volleyball, tennis, basketball, shuffleboard and plenty of activities to do with your kids. We pride ourselves on providing our guests with a great experience and appreciate you entrusting us with ensuring you have a terrific vacation. It is important to our team that our guests have an excellent experience that will ensure they return- we think it shows, just read our RECENT reviews! Panama City Beach is located just minutes from gourmet seafood dining, signature golf courses, amazing deep sea fishing, world famous night clubs, fabulous water and amusement parks, miniature golf, gift shops and the world-class entertainment and events Panama City Beach is famous for. Nearby, at the corner of Thomas Dr and North Lagoon Dr is Captain Anderson's Marina & Restaurant. You will find delicious fresh seafood, charter fishing boats, shell and dolphin excursions. Major grocery stores and retailers are also within a 5-10 minute drive. â€‹Take the kids over to Shipwreck Island waterpark for more splashing fun or take a pleasant stroll about a mile down the beach to Schooner's for a delicious meal or drink. If you're looking for great shopping and fabulous eateries, nearby Pier Park will fill the bill! With more than 125 retail, dining and entertainment choices, Pier Park is a one-of-a-kind beachfront family-friendly attraction featuring island-inspired architecture and popular stores. Dillard’s, JCPenney, Ron Jon Surf Shop, Target, Forever 21 are a but a few.